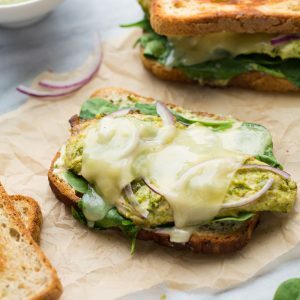 10-Minute Spicy Tuna Melts! An easy, flavorful and quick meal for times when you want something healthy, but satisfying! 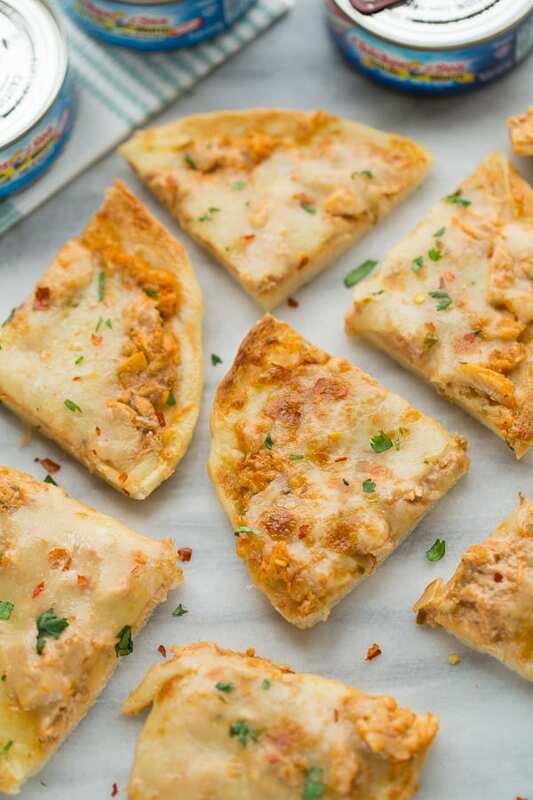 These 10-Minute Spicy Tuna Melts are the perfect meal when you want something easy and flavorful, but healthy and satisfying! They have 5 ingredients I always have on hand and make a delicious open-faced sandwich with one of my pantry staples – canned tuna and salmon. Canned tuna and salmon are great to have around for quick meals like this and now Chicken of the Sea has made canned tuna even easier with EZ-open lids. No more digging out the can-opener! These tuna and salmon cans are perfect for on-the-go meals. 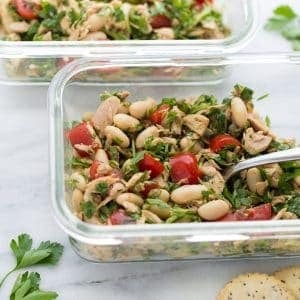 I especially love packing a tupperware with a little salad of olives, chopped tomatoes, minced red onion, parsley and olive oil to eat with a can of EZ-Open salmon or tuna for lunch when I’m not at home. 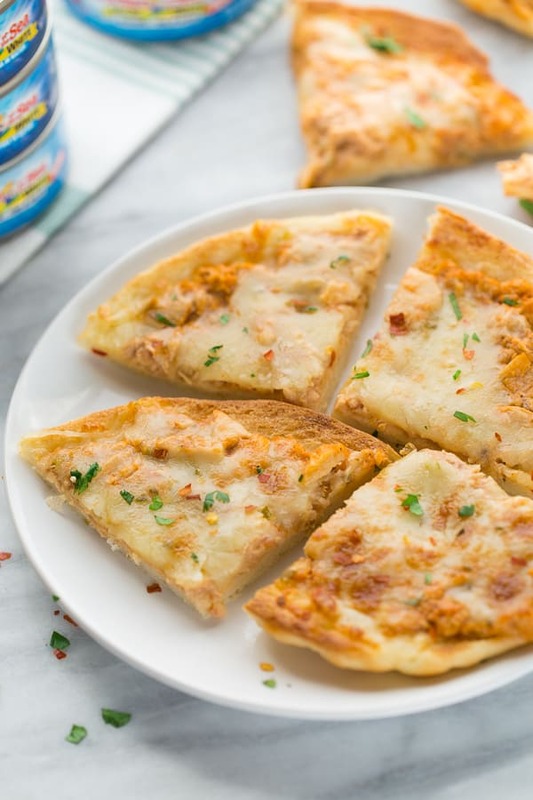 If I’m around a toaster oven or regular oven, these tuna melts can also be made so fast. Plus they look like pizza, but are full of healthy fat and protein. It can be hard to take the time to eat a good lunch in the middle of the day, but I feel so much better when I do! I find when I’ve eaten enough good food during the day I don’t get as many late-night snack cravings. Along with the launch of Chicken of the Sea’s EZ-Open Tuna & Salmon, Chicken of the Sea is hosting The Pull It Off Game. This is a game which features a virtual “kitchen” setting in an online game where players try to grab a Chicken of the Sea can as it revolves on a Lazy Susan Table. Chicken of the Sea is giving consumers the chance to win $25,000 worth of instant prizes simply for playing the Pull It Off game and grabbing the correct EZ-Open can. Consumers are able to play once per day and have three chances to grab the EZ-Open can for a chance to win prizes. Prizes will be offered in the form of mobile-friendly digital gift cards. The Pull It Off Game goes live on October 13- November 12 on Chicken of the Sea’s Facebook page! I hope you love this new and easy way to eat salmon as much as I do! Enjoy! 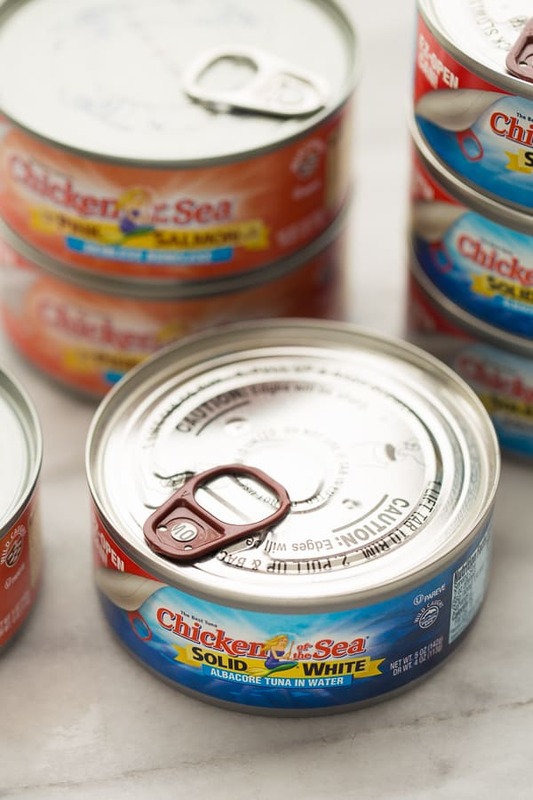 Chicken of the Sea EZ-Open cans make this recipe a breeze! Everything comes together in 10 minutes for a fast and healthy meal. I usually make this recipe with tuna, but it could work well with EZ-Open Skinless & Boneless Pink Salmon as well! Turn the oven onto the broiler setting. Toast the pita on one side for 1-2 minutes until golden and slightly crisp. Remove from the oven and flip. Open the tuna can and squeeze to drain all the liquid. Add the salsa and greek yogurt and salt and pepper to taste. Mix with a fork until combined. Spread the tuna mixture over the pita into an even layer. Top with the shredded cheese. Broil for 5-7 minutes, until the cheese is bubbly and everything is hot. (This time will depend on how hot your broiler is so watch carefully.) Let cool slightly then slice and enjoy! 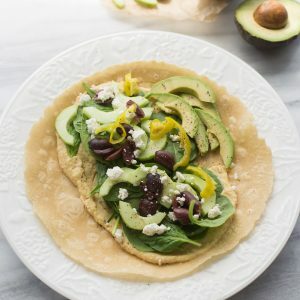 *I use the brand My Bread for the gluten-free pita that I find in the frozen section of Whole Foods but any pita, English muffin or even bread will work! I usually use regular sandwich bread for my tuna melts, but I love the idea of using pita! So good! I love the spicy aspect! And serving on pita sounds perfect! What a great idea to use pitas instead of bread! These look yummy! So smart to make it on pita, for a change, and the pepper Jack cheese is inspired! I wondered if you had ever made it with a tortilla bread or thought of using that instead of the pita bread? The recipe sounds good. I Love this recipe for gluten-free. Will make it soon for my family. Thanks for sharing. 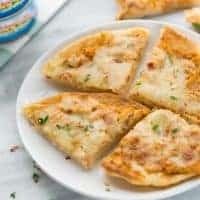 These tuna melts are so simple to make! They’re perfect for my busy days.